On the 12th anniversary of that September day when all our lives changed forever, Mackinac Island’s own Statue of Liberty returned to her home and became part of the Island’s Patriots Day celebration. The statue was originally donated to the Island in 1950 by the Boy Scouts of America, marking their 40th anniversary, which had the theme “Strengthen the Arm of Liberty”. Over 200 of the statues were donated to communities in 39 states, but the statue here on Mackinac is the only one given to the State of Michigan. The statues are about 8 1/2 feet tall – without a pedestal – weigh about 300 pounds, and were made by a company in Chicago. Our statue’s big sister stands in New York harbor, is more than 305 feet tall from the ground to the top of her torch, and weighs more than 150 tons. The Statue of Liberty replica on Mackinac Island has been used every fifth year to commemorate the attacks on 9/11/2001, and the Patriot Day services were conducted at that location in 2006 and 2011. Mackinac Island’s Statue of Liberty, as she stood near the marina from May 28, 1950, the date of her dedication, until November 28, 2012. The replica withstood 62 years of harsh northern Michigan winters and was in need of the kind of repair work only a specialist could handle – dents in the copper skin, seams that needed to be ground out or filled in, and spikes on her crown that needed to be replaced. Masons, excavating crews and landscapers all needed to be involved. American Legion post 299 on Mackinac Island wanted to refurbish the statue and bring it back to its original form. Post 299 Commander Paul Wandrie, said, “We are calling our drive to repair and relocate this statue, the ‘Save Our Statue’ or ‘S.O.S.’ Project.” The City of Mackinac Island also supported the project, the cost of which was estimated at approximately $61,000. On November 28, 2012, the statue was removed from her pedestal, with Winberg Masonry, Belonga Excavating, Davis Construction and Venus Bronze Works, Inc. involved in the project. The statue was shipped to Venus Bronze Works in Detroit for the winter, where she underwent a complete makeover. 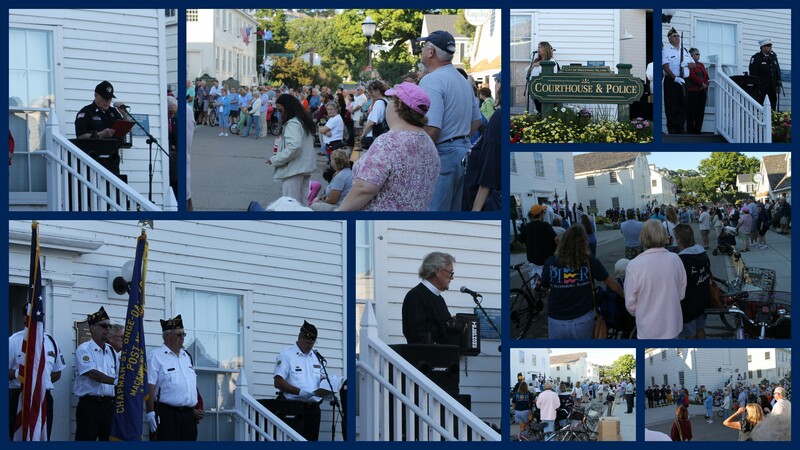 When Wandrie was contacted that the statue was finished (the pedestal still remains to be done), it all fell into place that the statue would return to the Island as part of the Patriots Day celebration on September 11, 2013. Shepler’s Ferry donated the use of their freight boat, the Sacre Bleu, for the trip across the Straits, and boats from Arnold and Star Ferry Lines, the Mackinac Island Fire Department and the Mackinac Island Historic State Parks planned to join the boat parade accompanying the statue on her crossing. Private boats were also invited to join in. Paul Wandrie and Chris Shepler both granted me permission to come across on the Sacre Bleu with the statue, and that is how I came to be aboard when Lady Liberty returned to the Island. Emotions were running just below the surface yesterday and kept threatening to emerge. I boarded Shepler’s to travel to St. Ignace (where the statue had spent the night in a Shepler warehouse). The statue’s Honor Guard, made up of Post #299 Commander Paul Wandrie, Mackinac Island Police Officer Ken Hardy, Mackinac Island Fire Fighters Jason Kladiva, Ron Langsworthy, and Jamie Bynoe, and EMT Mark Bielinski, were all aboard the same boat. As I rode over I was thinking about the events of 9/11/2001 and remembering – as we all do – exactly where I was when I heard that breaking news broadcast when the first plane flew into one of the Twin Towers. I was sitting at my desk in the Public Information Office of the Dougherty County School System in Albany, GA. The morning was just beginning, and we had a day packed with assignments, paper work, and visits planned into several schools. In the incredibly short time it took for a fellow worker to rush in from another office and shout, “Quick, turn on the TV!” (our office had the only TV in our 3-story building, as we were charged with keeping up with emergencies – weather or otherwise), all plans – and our entire world – changed. When we walked into the St. Ignace warehouse and first saw Mackinac’s Statue of Liberty – refurbished, no dents, all spikes of her crown in place and sparkling clean, I began to feel tears welling up and a throat lump forming. Compared to her big sister in New York City, she is shorter and weighs less; but she is still the United States’ symbol of freedom from tyranny and oppression, and – even in a warehouse – she carries the dignity and power of what she symbolizes like the great lady she is. The Honor Guard gently lifted the statue . . .
. . . and placed her on the flatbed wagon on which she would rest during her trip to Mackinac. The statue was pulled outside . . .
. . . and loaded onto the Sacre Bleu. One of the firemen placed his helmet next to Lady Liberty’s face, and it was then the emotions of the massive loss of the 9/11 event coalesced into tears that spilled over. Chris Shepler piloted us across the Straits as other vessels began to fall into place with the Sacre Bleu. We were joined by Arnold’s Chippewa . . .
. . . the Mackinac Island Historic State Parks landing craft, captained by Robert McGreevy, with Myron Johnson as deck hand . . .
. . . and Star Line’s new Anna May. As we sailed into the harbor, the Chippewa’s fire hoses, manned by St. Ignace Fire Department Lt. Matt Bowlby and Fire Fighter Nate Montie, opened up with a huge spray . . .
. . . joined by the spray from the Mackinac Island Fire boat. Passengers aboard an outgoing Star Ferry all stood as we passed. A Color Guard and a large crowd awaited the statue at the dock . . .
. . . where Lady Liberty was off-loaded . . .
. . . and began her trip through the streets of Mackinac to the Stuart House Museum. The Honor Guard gently removed the statue from the flatbed . . .
. . and stood her gleaming and straight back on Mackinac Island, her home since 1950. Back home and surrounded by the people of Mackinac Island. After the program and time for photo opportunities, the statue was carried into the Stuart House Museum . . . When the remaining funds have been raised, the statue will be centered approximately 100 feet west of where she formerly stood, which will give her a more prominent location. At this new spot, she will be seen by more people entering the harbor, and she will be more easily seen from the roadway. If you’d be interested in participating in this patriotic cause, donations can be sent to: American Legion Post 299, P.O. Box 1518, Mackinac Island, MI 49757 (checks should be made payable to American Legion Post #299). Or, if you’re on the Island and would like to donate in person, that can be done at the DPW Office on the 2nd floor of the Community Hall (see Bruce or Ellen). There is also a Paypal account where donations can be made. Simply go to the picture of the statue on the Legion’s Facebook page (https://www.facebook.com/AmericanLegion299?ref=br_tf), and click on it. All donations are tax-deductible. It’s on days like this that the magic of Mackinac can almost physically be seen winding its way along the streets and through the crowds. The people of Mackinac Island have always been a close-knit, kind and compassionate community. When something of theirs is in need of repair or replacement, they come together and find a way to make it happen. So it’s been with the refurbishment of Mackinac Island’s replica of the Statue of Liberty, and so it will continue to be for generations to come. Stand tall, Lady Liberty. We look forward to you soon taking up your new post at the entrance to the harbor! This entry was posted in fall on Mackinac Island, Mackinac Island, Mackinac Island Blogs, Mackinac Island living, Mackinac Island Tourism Bureau, Retirement on Mackinac Island and tagged American Legion Post #299, Arnold Ferry, Mackinac Island EMTs, Mackinac Island Fire Department, Mackinac Island Police Department, Mackinac Island Statue of Liberty, Shepler's Ferry, Star Ferry, Stuart House Museum Mackinac Island by bree1972. Bookmark the permalink. With tears in my eyes, what a lovely story. Thank you. I will look for her when I come in October. Thank you for going along and being the eyes and ears so we could all experience this from afar. I was following along yesterday on Facebook as several island locations posted photos, but you have captured the emotions as well. A very emotional and so eloquently written story Brenda. I’m so glad you were able to be on board for this. Thank you! (Like everyone else, I can also remember just where and what I was doing that morning 😦 ) I too look forward to seeing the great Lady next year. What a moving story. I had tears before I finished reading it all. Bree, you’re coverage of this story beautiful and moving. What an honor it was for my sister and I be present for this ceremony. Thank you and I am so glad you could make the ferry trip with Miss Liberty from St. Ignace to the Island and tell us so much of importance. And thank you to the Sheplers for taking the statue to Mackinac Island. I wish I could have been there for the ceremony. I hope it was filmed by someone. I vividly remember standing on the breakwall in the front of the Lady in the 1950s when she had only been on the Island for a few years. I was there to let the waves crash into the wall and shoot up over me. Great fun when you’re in your mid teens, but I don’t think I’ll attempt it again. I’m glad she kept our secret all these years so I could be the one to reveal my foolishness of years gone by. I also remember exactly where I was on I-96 on the north side of Grand Rapids when the news of the first plane hitting the World Trade Center came over the car radio. The coverage went on and on and after awhile I couldn’t take anymore. It was too horrendous. My grandson, Mitchel, and I were talking about it yesterday and he said that he couldn’t comprehend how anyone could do such a thing. I think it’s sickeningly amazing what brainwashing can do. What a beautiful opportunity for you to be a part of the process of bringing the Liberty home. Thanks for sharing that emotional trip with us.The photos tell it all and the history you shared is a wonderful thing to know. Another true wonder for the Island. Thanks so much. Excellent story and coverage Brenda! My team participated in a 9/11 Ceremony here on post. I’ll have to send you a picture. I too will always remember where I was on that day tragic day 12 years ago. Its moments like this….that you’re able to capture in your posts; that keep it fresh in my mind why I do, what I do. A perfect display in the Stuart House for Lady Liberty. Thank you for sharing all of this. A perfect way to remember and pay homage to 9/11. A great story and very uplifting! Tears for your beautiful words. I remember being in Disney World’s campground on that day. My parents and I had gone to a concert filled with youth groups on the 8th at the Magic Kingdom. My Mom had been impressed with how the kids seemed so nice, looked out for each other, and just different than what you hear on the news. I wonder if we were there just so she could see that and have hope in light of the days to follow. Lump in my throat & tears in my eyes. You are such a powerful writer and photographer. What a gift you are to all of us. God Bless! Great job and Story…keep up the great work! A great story…are you still going to be on the island in October? We are coming for our annual visit from Canada…. Yes. Tracey, we should be here. We will have to connect…. Awesome pictures along with a great story. Thanks. The people of the island sure did a good job, and your story of it is wonderful. Thanks.